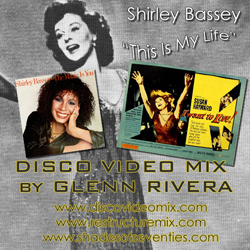 Dame Shirley Bassey took her 1968 hit, “This Is My Life” (original produced by Dave Pell) into the discotheques in 1979 with a full disco arrangement – this time around produced by Nick Decaro. The 12” disco single featured a remix by Mr. Rick Gianatos. This version was the toast of the town for Bassey fans or any dancer looking for drama on the dance floor. I have taken the song and paired it with the 1958 of a convicted murderer, Barbara Graham and later facing execution to bring the drama to curtain heights. The overly played heroine by Susan Hayward seems appropriate with this rousing disco- theatrical number. Featuring scenes from “I Want To Live!” – RENT THE DVD!